Having looked at how to achieve depth in my paintings, I'm moving my focus onto the lighting. It's pretty obvious that lighting plays such a crucial role in directing focus in a painting as well as the overall mood. But I've also found that different lighting brings out different subtleties in the paint itself. 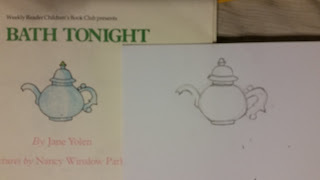 Here I did 3 sketches of the same teacup in different light. The teacup remained the same, while the light shifted position from directly in front of the cup, coming in from the side, and from directly overhead. I could do endless possibilities of this same cup, just moving the light around at different distances and angles. 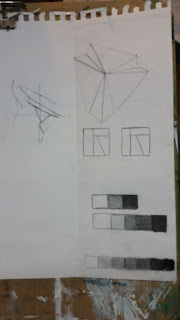 But I've already begun to notice small shifts in my eye from these three angles. Please note, it's not only the light that shifts. I found as I painted these three separate from each other, the cup shifted to the left or right on the saucer, and I managed to squash it down and raise it back up again in height. Oh well it's Artist 0, Perspective and Accuracy 3. One day I will win this game! 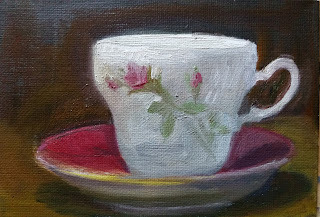 Here is the first one I did was with the light almost on my shoulder, facing the teacup . 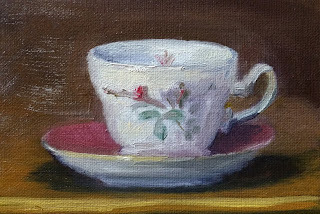 Most of the shadow fell behind the teacup, but a significant portion still was visible. With the light near me I noticed the depth of the table more. This is the squashed teacup. And it shifted to the right. Then I changed the light so it was coming in from the side. This was the easiest to see the warm and cool tones on. I also managed to straighten the teacup out a bit. 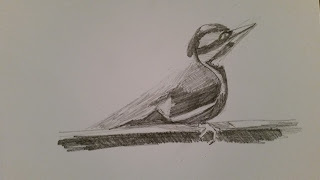 The perspective got more wobbly as I did. And finally I had the light beaming directly down from above the teacup. This was the hardest to capture the roundness of the teacup, but the easiest to do the edges of the saucer. 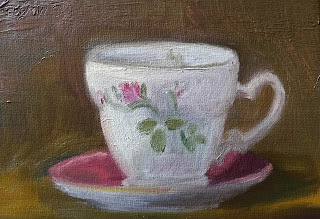 The hardest spot was to get the subtleties in the upper edge of the teacup since it was so bright from reflecting the light. Still, perspective didn't get as far away from me on this one.. . . but it still won. And understanding of light has begun, but is only just starting. I wonder how many teacups I'll need to paint before I can sense both the light and perspective. . . 100? 1000? Whatever it is, game on!